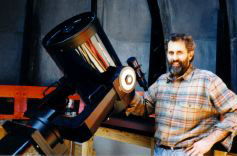 Haverford astronomer Stephen Boughn conducts research primarily in cosmology and extra-galactic astronomy. Since the 1990s, he has been searching for correlated structure in the cosmic X-ray and cosmic microwave (CMB) backgrounds, the radiation left over from the hot "Big Bang" beginning of the universe. Such correlations are directly related to several aspects of the large-scale structure in the universe, including the accelerated expansion of the universe by "dark energy," the way in which X-rays trace matter, and the presence of large amounts of ionized hydrogen in the universe. In a recent study published in the January 1, 2004, issue of Nature, Boughn and Robert Crittenden at the University of Portsmouth, England, compared data from a full sky map of CMB (made from NASA's Wilkinson Microwave Anisotropy Probe statellite), the hard X-ray background mapped by the HEAO1 satellite 25 years ago, and the recent, nearly full-sky, NVSS radio galaxy survey. Boughn's past research has included observing diffuse infrared and optical light in clusters of galaxies, which offers clues regarding the dynamic evolution of cluster formation thought to be dominated by "dark matter." Although astronomers believe it represents between 80 and 90 percent of the mass in clusters of galaxies, little is known about dark matter.